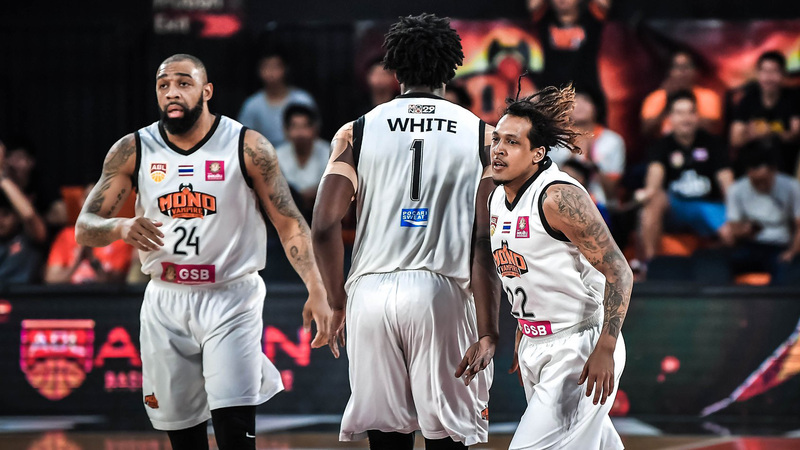 Mono Vampire seem to have the pieces that they want in place for their team with the arrival of Romeo Travis prior to their game against Wolf Warriors. The Mono Vampire won 113-92, but is was far from a perfect outing and there is plenty of room for fine-tuning… which makes them that much scarier. The previous game against the Wolf Warriors on January 30 had already seen the addition of Tyler Lamb set in place for the Mono Vampire, completing the team’s trio signing of the three most prestigious Thai heritage professional players at the moment. However, they were still missing new addition and import Romeo Travis in that game and suffered another tough loss by breaking down in the final minute. Mono Vampire had to wait until the morning before the rematch on February 2 to complete their eventual “dream team” with Travis finally flying in from Ohio, but they were sure he would be ready for his debut. What a difference two months make in the ABL. Possibly as an effect of the changes in player classification and import quota, there has never been a roster overhaul of this magnitude. There has also never been a team that has been able to completely turnaround a season this deep in the schedule with a roster shake up as well… but there is always a first time for everything. The Mono Vampire started the season in continuation from their previous ABL finals run with a team of players with definite set roles that complimented each other. Now, the starting five is a quintet of players who can all create their own offense, set up their teammates, while also not being at disadvantage on the defensive end. Singletary (26 points, 12 rebounds, 8 assists) came 2 dimes shy of his second-straight triple-double, Travis (12 points, 15 rebounds, 9 assists) was one helper away from a triple-double of his own in his debut, Malcolm White put in 23 points on 11-18 shooting, and Freddie Lish had a cool 19 points to go with 8 assists. On paper, this surely among one of the best starting units in the entire league. Tyler Lamb has a tendency to gamble on defense. It’s what has led him to be among the top all-time steals leader in the ABL. It’s what he does, it’s what he’s known for… and it’s also why he sometimes has trouble staying on the court after compiling fouls. Lamb debuted with 24 points, 9 rebounds, and 7 assists in the previous game but was locked down to the bench early with two quick fouls in this game. The 3-year ABL veteran eventually finished the game with 11 points but only saw 13 minutes of action with 4 personal fouls. Thankfully for the Mono Vampire and Coach Douglas Marty, he now has the option to bring in starter-level players like Darongphan Apiromvilaichai, Moses Morgan, and Chitchai Ananti off the bench. The perimeter trio has been bugged by the pressure of a disappointing start to the season, but should now be more relaxed with the chance to come off the bench for a change. In this game, it was “Palm” Darongphan Apiromvilaichai who showed up and had his best game so far of the season. In the previous 14 games, Palm had scored a total of 27 points accounting for a miserable 1.93 points per contest before exploding for 18 in this game. The important thing was that this wasn’t an out-of-body experience, it was just him being able to play his usual game that had made him so effective in the past. Now with the attention of the defense have to focus on so many options, it becomes much more easier for Palm to slip and slide in for sneaky layups and get open corner threes. Once he doesn’t have to force and focus too much on offense, he can completely dedicate himself to defense as he did by getting under the skin of Mike Taylor. The ex-NBA guard got his points in bunches, but Palm was able to get him to the point where it disrupted the rhythm of the offense for the Wolf Warriors. Successful defense turned into a flurry of 23 fastbreak points, restoring a part of what made the Mono Vampire a difficult team to deal with last season. At this point, there’s not much to worry about the Mono Vampire on offense. With that much talent and a selfless facilitator like Travis now in the mix, things will eventually figure themselves out. The team’s next question to answer will be on defense which they will have to figure out in limited time. Coach Douglas Marty will live with Mike Taylor scoring 37 points, but the teams that Mono Vampire will have to face in the remaining 10 games of the season will have more firepower surrounding their first option. There were some defensive lapses that left open shots for the Wolf Warriors to take (and miss) and it’s possible that the higher-ranked teams in the league won’t be missing those shots. Travis will have time to adjust and get used to the system and the team before we will be able to properly assess the team’s defense. Finally, I’d like to properly point out how well Lish has been doing in the starting point guard role and in sparking late game rallies. He’s averaging 18.0 points, 8.0 assists, 4.5 rebounds, and is sniping at 53.3% from long range in his first two starts of the season. He was the one who made the big shots to get Mono back into the game in their loss on Wednesday and the one who made the big shots to blow open the lead in Saturday’s win. Crucial turnovers aside (painful turnovers though), Lish has stepped up well to the plate in the middle of a struggling season. Not to compare him to Jason Brickman in anyway, his two consecutive solid outings surely deserve some recognition and the Mono Vampire hope that will continue.